Poffertjes (lit. "little puff/puffard") look like tiny pancakes, the size of a US dollar coin (1.5 inch, ≈4 cm). They are very popular in Holland/The Netherlands since at least the mid-1700s, when they started to appear in cookbooks. Some sources claim they actually originated in France. Anyway, in the early years, the only ingredients were water, yeast, and buckwheat flour - truly a meal for the poor! Expensive ingredients such as milk, wheat flour, and eggs were added to the recipes much later. The recipes always call for yeast, to get the puffiness. Contrary to baking pancakes, poffertjes are turned over when the batter has not yet completely set. This is when they puff up (hence the name), and it also keeps them softer on the inside. Danish aebleskiver (lit. "apple slices") are really very similar to poffertjes, though somewhat larger. No, poffertjes are not some kind of blini. 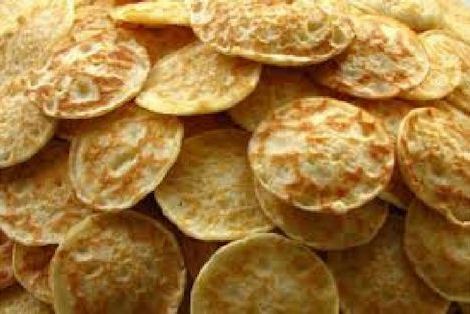 A traditional eastern-European/Russian blin is much bigger: about 15 cm (6 inch), like a small crêpe but made with a yeast batter. A blin can basically be served with any topping/filling that is sweet (berries, chocolate, jam, sweetened condensed milk) or savory (chicken liver, pickles, ground meat, mashed potatoes and onions, salmon and caviar with sour cream), and at any time of day. Yes: in "the West", the word blini is indeed (mis)used for thick, dense, sticky, and relatively tasteless little pancakes. Poffertjes are simply served with a pat of butter and a good dusting of powdered sugar. 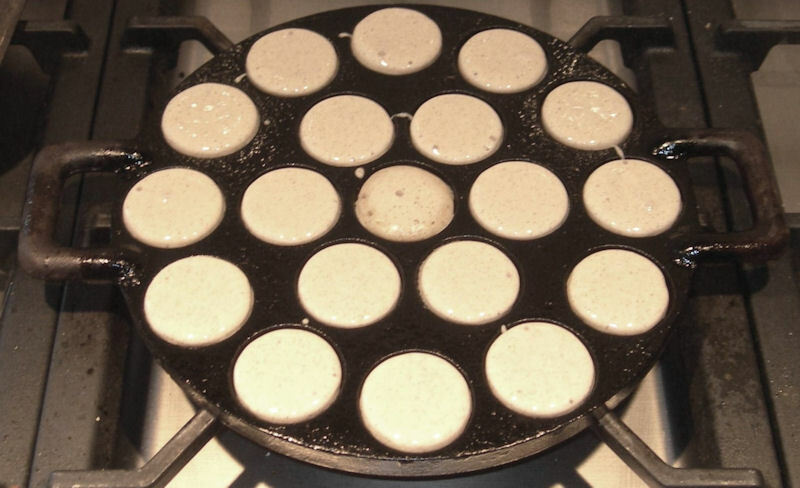 Poffertjes are baked with a special dimpled pan. For the home-cook, is easier to get good results with a heavy cast-iron griddle/pan, then a thin sheet metal one. I have regular cast-iron pan with a diameter 24 cm (9½ inch), 19 standard size dimples. It weighs 3 kg (6.6 lbs). 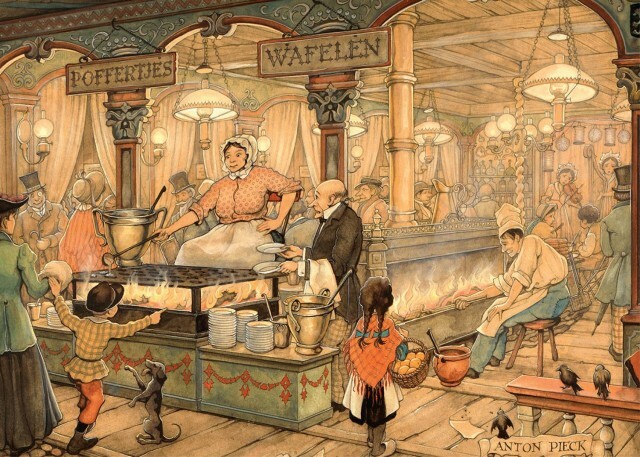 When the Dutch settlers went to North America, they took their poffertjes recipe and the requisite special pan with them. In Australia, you can find "Dutch pancake" pans. 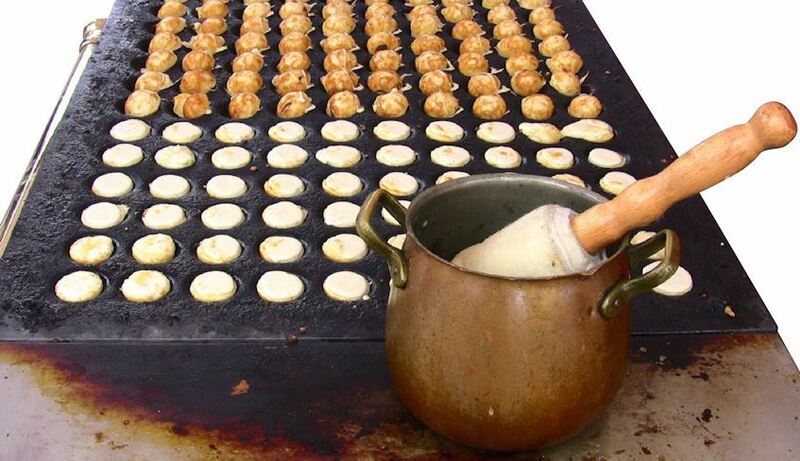 The poffertjes pans are not unlike Japanese takoyaki pans (that also come in cast-iron and sheet metal varieties). 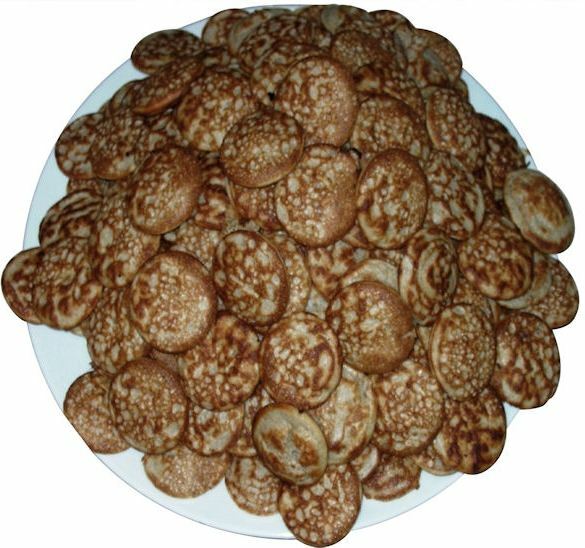 Poffertjes (without butter and powdered sugar) can be frozen. Thaw out and heat up in a frying pan over medium heat for about 2 minutes. 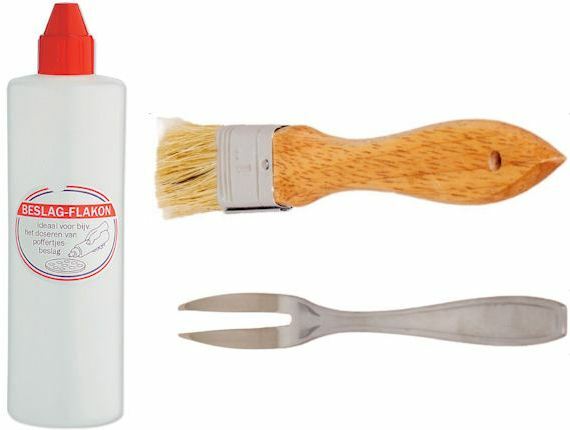 Use an regular bristle brush; with a modern silicone brush, it will be harder to properly grease the dimples. regular butter has a smoke point of only 175 °C (350 °F); at this temperature, the butter begins to smoke and burn, which is unhealthy!!! clarified butter (butter fat without milk solids) has a smoke point of 230 °C (450 °F); see this page for how to make your own, its quite easy. While stirring, mix in the rest of the milk. The batter should run off a spoon, like very thick buttermilk. If too thick, add some milk. If the pan is not hot enough, the poffertjes will stick to the pan. You will just have to get some feel for this. Be prepared to throw away your first batch. Put a tablespoon of butter or oil on the middle of the hot pan and completely brush all dimples with it. With the squeeze bottle, quickly fill each dimple to about 3/4. Don't randomly fill the dimples, but develop a specific sequence. The batter will rise a little bit, and small bubbles will begin to form. 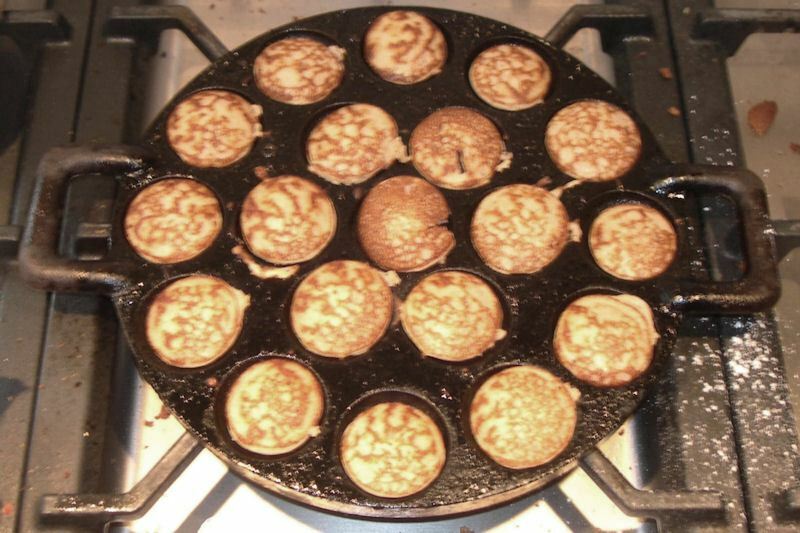 A poffertje is ready to be turned over (with the small two-prong fork or with the help of wooden skewers), when the top of the batter begins to turn dull (no longer looks wet), bubbles begin to cave in, and the edge of a poffertje is dry (and possibly golden). Note: obviously, the first dimples that you filled will have to be turned over first. When the pan has the right temperature, the poffertjes should begin to detach from the pan at this point. By the time you have turned over the last one, the first one will probably be ready to be removed from the pan. Remove them in the order that you filled the dimples. If you leave the poffertje in the pan too long, they will have a hard, dark edge - doesn't look good & taste good.. Turned over, puffed up, and almost done! Freshly baked poffertjes cool off really fast! Serve on small plates or large saucers that have been heated up in the oven. 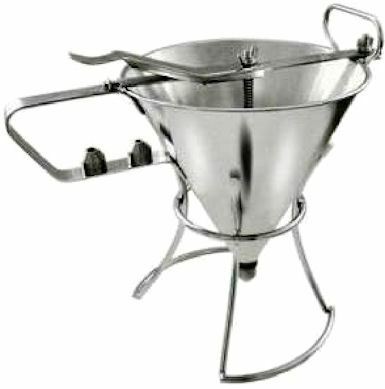 If your powdered sugar is lumpy, then press it through a small fine-mesh sieve (like a tea strainer) with a spoon. As with all cast-iron griddles and pans, do not wash it with detergent/soap after use- you will remove the non-stick "patina"! Just wipe it clean with paper towels, rinse it with hot water, brush if necessary, then dry off. That's all. Your pan is seasoned, and should be kept lightly greased. If you do wash the pan, next time you use it, you will have to season it all over again! Follow the instructions that came with the pan! ©2000-2016 F. Dörenberg, unless stated otherwise. All rights reserved worldwide. No part of this publication may be used without permission from the author.